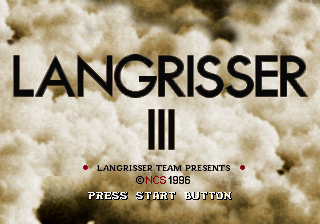 Langrisser III (ラングリッサー III) is an entry in NCS's Langrisser series released for the Sega Saturn in 1996. Main article: Langrisser III/Magazine articles. Main article: Langrisser III/Promotional material. \LANG\OMAKE\DYHALT.TXT TXT 3,290 Supplementary explanation about this game. \LANG\OMAKE\FREA.TXT TXT 8,437 Supplementary explanation about this game. \LANG\OMAKE\KANIO.DOC TXT 6,894 Messages from the developers. \LANG\OMAKE\LNG_5.TXT TXT 4,175 Supplementary explanation about this game. \LANG\OMAKE\README.DOC TXT 6,516 Messages from the developers. \LANG\OMAKE\RIFANY.TXT TXT 3,487 Supplementary explanation about this game. \LANG\OMAKE\RUNA.TXT TXT 3,866 Supplementary explanation about this game. \LANG\OMAKE\SOPHIA.TXT TXT 1,879 Supplementary explanation about this game. \LANG\OMAKE\TEALIS.TXT TXT 1,722 Supplementary explanation about this game. \LANG\OMAKE\TOKI_LNG.TXT TXT 5,450 Supplementary explanation about this game. L_ABS.TXT TXT (Abstract) 146 About this game.